Be honest and blunt, but funny. Never have anxiety (it’s good for nothing). Be proud and love your children. AND for sure: Don’t waste your time. Reprinted with kind permission from the author, Sharifah Qureshi, seen below. Guest blogthor Sharifah at 4 a.m. on a recent Milwaukee morning. It’s Boxing Day. This Post’s For You. Holidays! They pass us by in a daze. Before those of us in the Central Time Zone close our books, officially, on Boxing Day 2012, there’s something I need to share with you. If you can’t pluck ’em, smell ’em. That’s what these next posts are all about. It’s not exactly mine to share. It came from a friend. This friend has been with me and my family for about 16 years now, from Milwaukee to Thailand and back, from an emergency room in Seattle to post-op in Milwaukee. When she isn’t drinking wine and eating bhel puri with us here, she’s lived in places that we are at best encouraged to avoid and, at most, blocked by U.S. passport or warfare from entering. Darfur and Zimbabwe top that list. Her husband is off to work in Haiti in a few weeks. So when this friend shares something, when she knows something, I feel it’s truth in my bones. She’s real like that. The post that comes next is written by her, and it feels true. It’s inspired by someone very close to her: a woman I met just once, too briefly. Though it’s inspired by someone I didn’t know, this writing feels familiar and necessary. The sorrow that inspired it, that sense of “before it’s too late” — you’ll feel it when you read it — is elevated by just enough humor to get you through. This should give you some idea of how the woman who inspired “Things I Learned From My Sister” lived five full, hectic, stylish, odds-defying years with terminal cancer. Posted subsequently in its original form is “Things I Learned From My Sister.” All I did was add some extra punctuation. That’s about all my friend Sharifah needed. Commas, periods, a few extra line breaks. Practicing lines 8, 9, 11 of “Things I Learned From My Sister” with “Things” author Sharifah, standing second from right. Bhel is not rocket science. It is delicious and versatile. You can make it from scratch or from half-scratch. You can make it with two chutneys or three. The two-chutney variant seems the most common: plummy-brown tamarind chutney and ubiquitous minty-green chutney. The tamarind will be sweet and tangy; the green will be a fresh punch of cilantro and/or mint, which you can make very very spicy with 3-4 chili peppers or keep milder than a white kitten. Your call. Bhel: There are lots of ways to this. As noted in earlier posts, the basis of the Bhel is a puffed-rice, peanut, gram-flour medley that you mix with boiled, cubed potatoes, chutneys, fresh fruit and then top with a garnish of tomato, onion, cilantro and the thin crispy noodle known as sev (sounds like: save). You certainly can make the bhel mix yourself. But as a blogger I’m here to give (and get) A-grades for effort, not for authenticity. I buy the mix and the tamarind chutney, which are available anywhere Bhel mix and sev are sold. 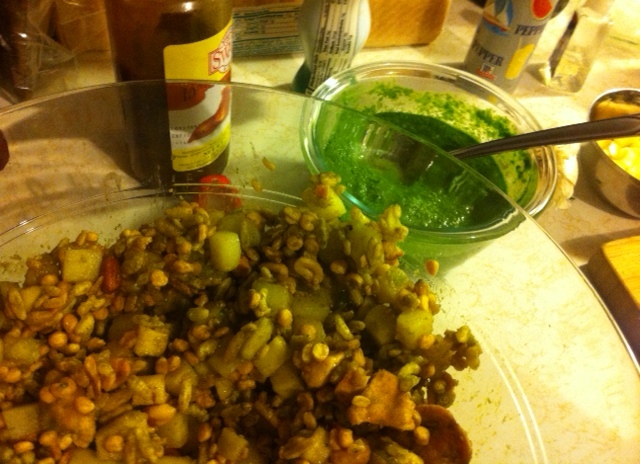 I do make my own green chutney – a blend that gets its green from cilantro, not mint. You can google and gather numerous green chutney recipes easily. The minty chutney is fine to use here, if you prefer. Cilantro, tomato, red onion, wedges of lime, sev (crispy rice noodles) – for garnish. 1. Make or buy the chutneys. Most mixes come with instant chutney packets. So that’s another option. 2. Get that potato ready. 3. While the potato cooks, chop the cilantro and dice the tomato and red onion. Don’t mix them together, however. 4. Now get ready. No more distractions. 5. Combine the potatoes and the bhel mix. 6. Add the chutneys. Mix, mix, mix. The concoction should whisper to you like a bowl of rice krispies in milk: snap, crackle, pop, gentle hiss, repeat. The chutneys should coat the bhel/potato mix so every puff and cube glistens. Again, I use more of the tamarind than the green chutney. Don’t add all they chutneys at once. Pour, mix, sample, decide. Repeat until it’s got the right spice and zip for your taste. 7. Throw in your fruit of choice: granny-smith apple or green mango. 8. Garnish to your taste. I start with the tomato, then the onion. Sprinkle that cilantro. Save the best garnish, that’s the sev, for last. 9. Squeeze a little extra lime on that. Serve! You can use Idaho or Yukon potatoes, but red is my first choice always. Be sure you don’t overcook that potato. Mashed potatoes are for Thanksgiving not Bhel Puri. You can make a giant batch of bhel puri and blend in the chutneys all at once, but I don’t recommend this. Ask your guests how they like it: spicy or sweet, dry or drenched, then mix a bowl per-person, one at a time. This way you control the spice and accommodate each diner individually. Bhel puri gets soggy quickly. Mix the chutneys, garnish and serve right away. About those chutneys: I have not hit the right balance between the right chutneys, nor have I mastered the perfect chutney to bhel ratio. I think this might be a case of “more is more,” not “less is more.” The bhel should be flavorful and moist. So I’ll be adding more chutneys to subsequent batches. Once I master a recipe that features the perfect flavors in the perfect proportions, I will quantify and share here. I know I know. You cannot wait. But don’t let anticipation stop you from experimentation. Make Merry, Make Behl! Anyway, my oldest is most like me, a three-generations filtered version of Euro-Milwaukeean: Germanpolishirish. We freckle on the shores of Lake Michigan in the summer and we attract cell-phone photographers when we vacation on the Arabian Sea. Anyway, I feel bad saying “no.” Plus, the older I get the more folks I meet who are making the effort to learn how to make thalis and chutneys and curries for themselves. If they’re investing the time and patience to master moong daal omelets and that delicious, breakfast-time study in contrasts known as masala dosa, then why not I? I took my first lesson from my mother-in-law (MIL) ten years ago. 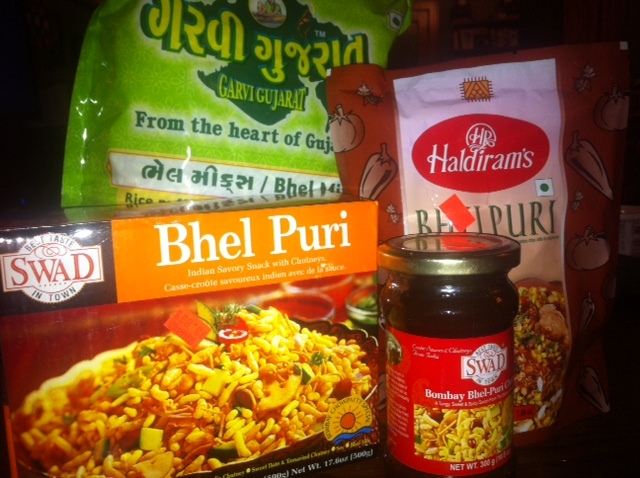 We started with bhel puri, but all I remember is the tamarind chutney. Bhel is mixed with 2-3 chutneys depending on the recipe, and the deep-brown, limey, syrupy tamarind chutney is the best. My MIL made this from scratch and she spent what felt like an eternity blending, diluting, spicing and perfecting the chutney. The chutneys need to be thin enough to spread easily and liberally over the puffed-rice/chopped-potato mixture that is the foundation of bhel puri. I asked my MIL to repeat the names of the ingredients, the exact ratio of water to tamarind paste. “Little bit of this, little bit of that; Pinch of this, maybe a few drops of that; It depends on what you like,” were her stock replies. I found the flexibility of her approach exhausting and indecipherable. I quit that night. Now, with a few shortcuts and some words of advice to you, I am back. And I brought bhel. Recently I was in Mumbai. It’s a fascinating, frustrating, bustling, busted-up, breaking-out kind of city. There’s so much going on, progress has been made, folks never stop eating, talking, giving you advice you never asked for and second-third helpings of food you never asked for. Mumbai also is dirty – monsoons, mega-population, corruption, infrastructure needs might help to explain the city’s gritty, dusty, weather-beaten look. I tried reading “Maximum City” about five years ago. It just did not go well, which says more about my attention span than about the quality of the book. …or would I? Oh yes I will. Hence, the name of this blog might become more meaningful to my reader (hi mom!). 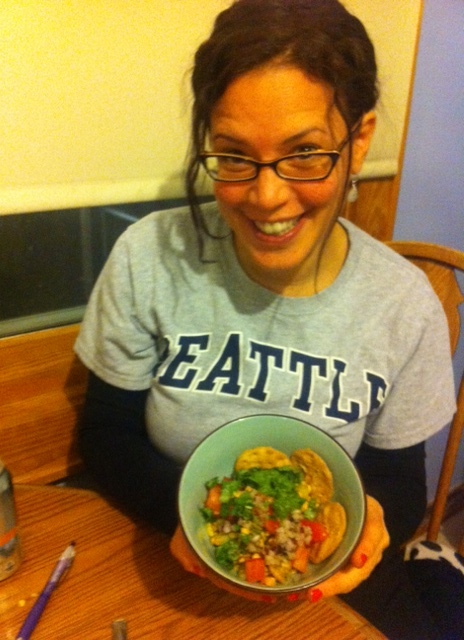 Last week I initiated my Chutney Challenge with a crowd-pleasing classic: bhel puri. “Bhel” rhymes with “whale.” “Puri” translates roughly to bread and rhymes with Suri (Cruise; sort of). Bhel puri is colorful, versatile, and easy-enough to make and to eat. Here in the U.S., you might not find it on an Indian buffet or the menu of a pricey fusion restaurant. But in India you can find it anywhere: street corners in big cities, backroads in beachy southern towns, at your aunt’s place because your mother-in-law will tell every living relative from Mumbai to Madurai that her American daughter-in-law loves bhel puri. Then everybody makes it for you. This is a good thing, because nobody will let the American laughter-in-law buy bhel puri from vendors on the street or on the beach. For sanitation reasons, street food is not considered a wise choice for the western GI system. In an upcoming post, I will share with you my own experiences making, sharing and explaining bhel puri. Or you can just google some recipes. They’re out there. But I have shortcuts and funny musings to supplement my recipe. So maybe you’d best stick to the buffet for now and come back to Chutney Challenged in a day or so. Tip: bhel puri pairs best with Corona Light. If you’re reading this, congratulations! Like me and some six billion other people, you have just survived the Mayan Apocalypse. Perhaps you can relate to my feeling of oh-great-now-what(?) malaise. You see, with the gift of another day and several inches of snow, I have some things to do, some promises to keep, some nagging obligations to attend to. Shovel snow – it’s 12:30 a.m. and still snowing; let’s wait a while. This is what I look like on Fridays, or when I wear a black cardigan. There are more points and purposes to this blog. The name “Chutney Challenged” describes me in ways that shall become clear as my writing becomes more fluid, and I learn how to blog. I tried starting this blog days ago, but was momentarily set back by the vast amount of templates, font choices, color palettes available on wordpress.com. I felt like my two journalism degrees were really not up to this, that what I needed was an interior design background. The colors! The mastheads! Look at the swirly things hanging onto this template. Oooh. Pretty. So, obviously, it might take me a few weeks to six months to post my next entry.